Established in 2000, EG Threads got its start in an attic of a warehouse building with a 6-color manual press and a very small dryer. Using the name Evil Genius and some of our own designs, we targeted the local skate and surf shops along with small bands in the Sacramento area. We steadily evolved over the years from a small clothing line into a large scale full-service apparel embellishment company. We service retail lines, promotional marketing firms, licensees, and private label customers. 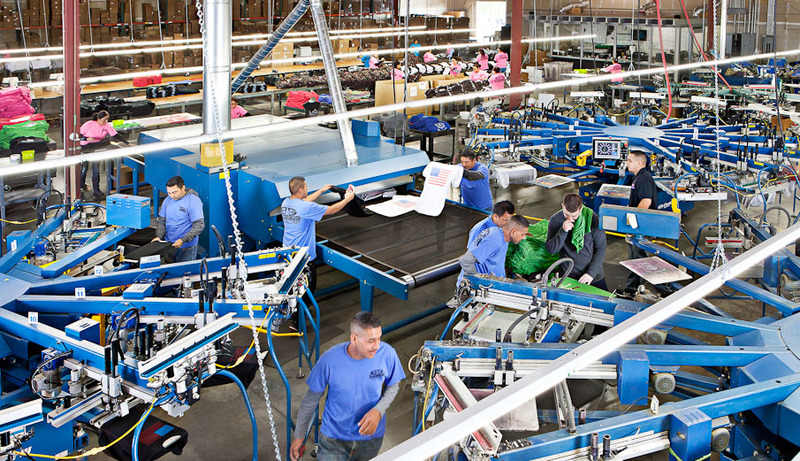 At EG Threads we pride ourselves on quality, efficiency, and customer service. We look forward to being your number one source for embellished apparel needs. It is the mission of EG Wear Inc. to be recognized in the Screen Printing Industry as the best value and quality provider of products and services. We are in business to build lasting relationships through superior service based on honesty, reliability, professionalism and ethical business practices. EG Wear Inc. accomplishes this goal by providing the consumer with the highest quality screen printing and textile products at market friendly prices. We offer Creative Design Services to our customers which allows them to work with our artists and take their designs to the next level. Our Fulfillment Services enable us to improve your company's supply chain. We offer full service custom warehousing, picking, packing, shipping, and inventory management. Our Turn-Around Time for standard production is 10 business days. Production begins upon approval of artwork and receipt of goods. Rush services are available upon request. At EG Threads we pride ourselves on Quality Control, Efficiency, and Customer Service. We strive to be the best value and quality provider of products and services in the industry. We offer a wide range of Promotional Products that provide innovative marketing solutions at competitive prices, delivering a quality product for a great value. We offer finishing services to our customers including retagging, hang tagging, individual folding, poly bagging, ticketing, and packaging. We now offer our Wholesale Clients the ability to log in to our website from anywhere to place, edit and track their orders. Meet a team of industry experts. Experienced leaders who take your thoughts and ideas and turn them into reality.